The Kaprolaktam Plant of the Sibur-Neftekhim joint stock company in Dzerzhinsk, Russia. The legacy of Cold War weapons programs has left environmental blackspots throughout the former Soviet Union, but Dzerzhinsk is by far the worst. The city's own environmental agency estimates that almost 300,000 tons of chemical waste  including some of the most dangerous neurotoxins known to man  were improperly dumped in Dzerzhinsk between 1930 and 1998. Parts of the city's water are infected with dioxins and phenol at levels that are reportedly 17 million times the safe limit. 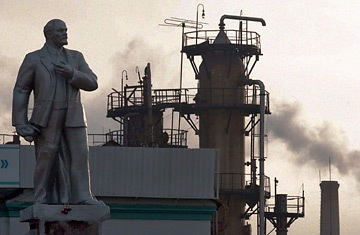 The Guinness Book of World Records named Dzerzhinsk the most chemically polluted city on Earth, and in 2003 its death rate exceeded its birth rate by 260%.